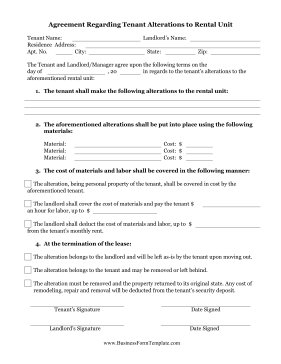 For tenants renting apartments and other rental units, this free printable contract can be agreed upon with the landlord concerning repairs, improvements and alterations. Materials and costs can be filled in. The alteration, being personal property of the tenant, shall be covered in cost by the aforementioned tenant. The landlord shall cover the cost of materials and pay the tenant $_____ an hour for labor, up to $_____. The landlord shall deduct the cost of materials and labor, up to $_____ from the tenant's monthly rent. The alteration belongs to the landlord and will be left as-is by the tenant upon moving out. The alteration belongs to the tenant and may be removed or left behind. The alteration must be removed and the property returned to its original state. Any cost of remodeling, repair and removal will be deducted from the tenant's security deposit.